Modernism and minimalism may permeate current contemporary design trends, but traditional design and décor is something that is timeless and will never go out of style. Traditional homes are characterized by classic architectural details, sumptuous furnishings and an abundance of accessories, all rooted in European sensibilities. With traditional style, it’s all about maximalism that blends together the timeless and the ornate. Whether you’re decorating for a pied-à-terre in the city or a suburban bungalow in a putrajaya property development, traditional style lends itself well to any space. In today’s guide, we’ve rounded up a number ofclassic décor elements that every traditional home needs to have. Even when you’re not blessed with deep pockets, these essential elements will help you get the same look in no time at all. In a traditionally decorated space, it’s all in the details. Architectural elements such as molding and paneling are important characteristics of traditional style. Nothing says traditional more than classic and ornate ornamentation. Consider adding crown molding where your walls meet your ceiling, medallions on your ceiling, or even paneling in your walls for added depth and dimension. These elements add a sense of timelessness and character to your space and are capable of transforming and transporting your space back to more elegant times. 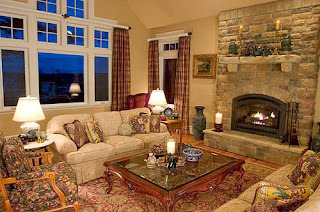 Not all of us have the option of adding decorative architectural elements to our space, especially since its permanent. For those living in rented quarters, décor pieces can aid greatly in your traditional decorating endeavor. Nothing says traditional like gilded and carved furniture and décor. For example, gilded mirrors leaning against or hung on your wall are great construction-less alternatives to intricate wall molding. You can also accomplish the same effect with gilded picture frames. If you have any treasured and prized pieces of artwork, consider framing them in a beautiful gilded frame to make them even more magnificent to behold. They’re often thought as superfluous or added as an afterthought, but this is a mistake. 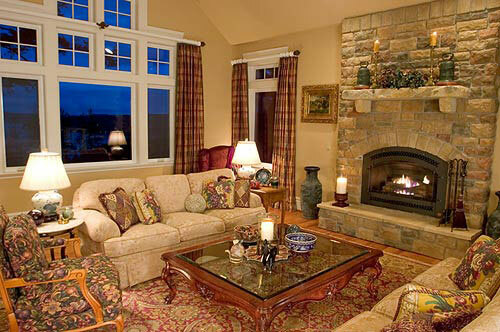 Window treatments are a great way of adding a more traditional style to your space. Consider embracing more opulent and ornate window treatments for your space, such as a richly embellished curtain in a vibrant chinoiserie or a brilliant classic print. You can also use curtains as more of a décor treatment, even if you don’t have windows. Hang them from the tops of your walls and around the room in place of paint jobs or wallpaper. This also draws the eye upward and elongates the visual perception of space. Nothing says opulence more than a grand chandelier. A statement-making chandelier can capture the perfect tone of traditional and formality. This lighting fixture is a versatile piece that can be dressed up or dressed down depending on how formal or how casual you want your space to be. You can also vary the size of it depending on the size of your space for the best proportions. Whether you choose one covered in crystals or one that is gilded in gold-leaf, it is sure to make a grand statement for your space. Antique furnishings can instantly add character and personality to your interiors. What’s more is that they’re a good investment that are trendless and stand the test of time. Well-made antique pieces, as relics of the past, carry the weight and story of bygone eras and will never fail to become conversation starters. Consider a beautifully carved fauteuil or bergère to add a Francophil twist to your space. If you don’t have deep pockets to splurge on antique furniture, that’s fine as well. Elements such as neoclassical-style columns, busts and porcelain urns are great accessories that can lend an outsize sense of age and give any interior the traditional patina it deserves. Marble is a beautiful material that can add an instant aged vibe to your space. It represents luxury and glamour and has been making a modern comeback in the world of interior design. When used sparingly, it can give any space the perfect touch of traditional. For example, a marble mantel to your space can be turned into a focal point for your room and presents a spotlight for your décor pieces. A marble mantel is a great backdrop for your more diminutive pieces, such as small sculptures, vases and accents that will surely be rendered all the more exalted for their pride of place. Whether your house has beautiful parquet flooring or just plainly-stained wooden floors, a beautiful traditional rug is a timeless key piece that not only covers and protects your floors, but also adds a subtle refinement to your space. There is always a rug that can perfectly complement your furniture choices, whether it is an oriental-style rug, a piece of Persian craftmanship, or a simple kilim rug. These rugs, with their impeccable craftmanship and intricate designs serve to enrich your room with a se of place in history and will surely be passed on in your family for generations to come.